Bunco 4 Boobies held its 10th annual “Rolling 4 A Cure” fundraiser Sunday night. The group raises money for local cancer patients who are undergoing treatment. Bunco 4 Boobies President Jessica Artz and five other committee members organize the “Rolling 4 A Cure” event each year. The event has raised nearly $190,000 over 10 years, Artz said. 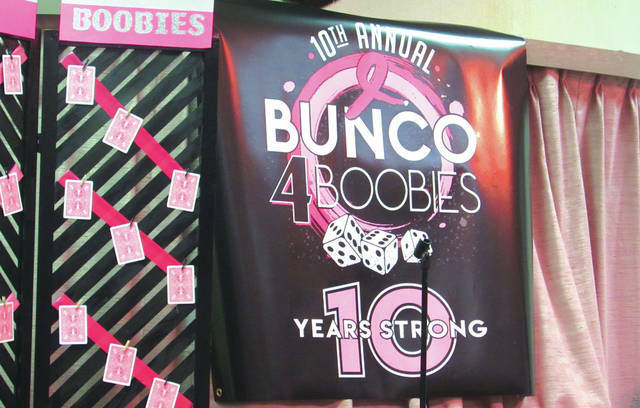 GREENVILLE — Local nonprofit Bunco 4 Boobies held its 10th annual “Rolling 4 A Cure” fundraiser Sunday night at the Greenville Moose Lodge. 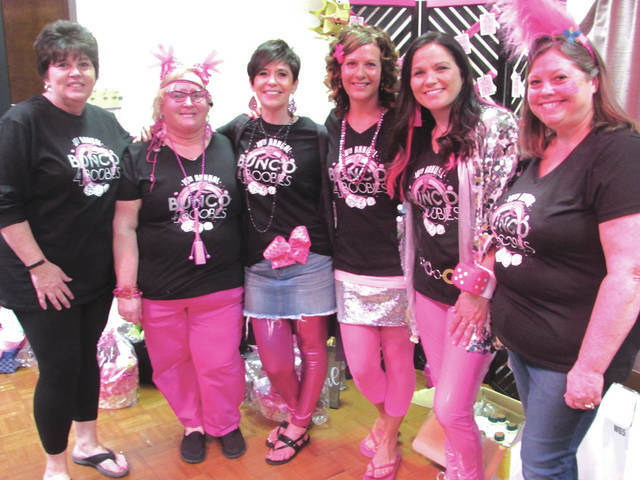 Bunco 4 Boobies raises money for the Cancer Association of Darke County, as well as individual cancer patients from the area who are currently undergoing treatment, according to Jessica Artz, the group’s president. “100 percent of the money we raise stays in Darke County,” Artz said. Sunday’s event featured T-shirts, sweatshirts and raffle tickets for sale, as well as prizes worth up to $200. Though final donation numbers haven’t yet been calculated, Artz said, she anticipates an impressive haul. “It looks to be a record-breaking year,” Artz said. Artz said she had something very different in mind when she organized her first breast cancer fundraiser a decade ago. The group’s single biggest fundraiser brought in $32,000, according to Artz, and over the last 10 years they’ve raised just under $190,000. The idea for the event came from Artz’s circle of friends. 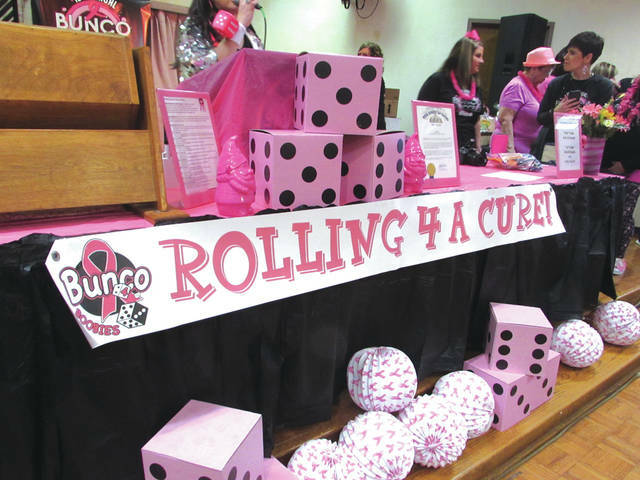 “Bunco is kind of a social game, and we had a group of about 20 ladies who played,” Artz said. When one of those women was diagnosed with breast cancer, the first “Rolling 4 A Cure” event began to take shape. Each year a portion of the event’s proceeds go toward private, individual donations with the remainder going to the Cancer Association, according to Artz. The Cancer Association has been able to increase funding for a lot of its services based on money her group has raised, Artz said. The most rewarding part of being involved with the charity, she said, has been the ability to have an effect on the lives of complete strangers. There are also challenges, Artz said, including balancing the demands of their fundraising efforts with those of work and family. Ultimately, Artz said, it’s the community that makes all of their efforts worthwhile. The event also brings a lot of enjoyment to those who participate, according to Artz. This entry was tagged Bunco 4 Boobies, Cancer Association of Darke County, Fundraiser, Greenville Moose Lodge, Moose, Nonprofit, Rolling 4 A Cure. Bookmark the permalink.